2. Preheat oven to 180°C. Season chicken. Heat oil in an ovenproof pan over medium heat. Cook chicken for 3-4 minutes each side until golden. Transfer to the oven for 5 minutes or until cooked through. Rest while you prepare the salad ingredients. 3. Remove figs from syrup and halve. Slice the chicken into strips. 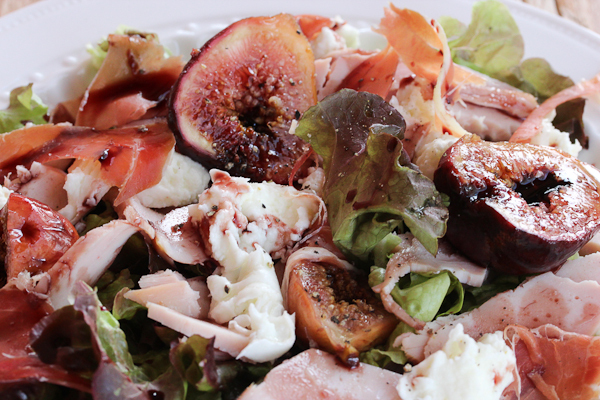 Arrange chicken, figs, mozzarella, prosciutto and rocket on a serving platter. Drizzle with some of the spiced fig syrup, then season and serve. * Chicken breasts with skin on are available from butchers and poultry shops. ** Buffalo mozzarella is from delis and gourmet food shops.